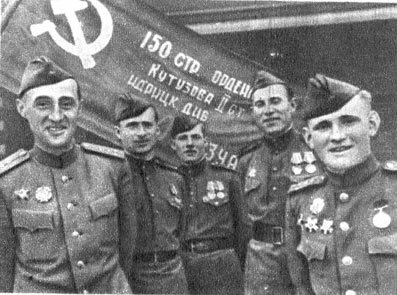 Meliton Varlamovich Kantaria (5 October, 1920 – 27 December, 1993), Georgian Hero of the Soviet Union (8 May 1946), was a Georgian sergeant of the Soviet Army credited to have hoisted a Soviet flag Banner of Victory over the Reichstag on April 30, 1945, 21.50. Despite Soviet records, the iconic picture showing him fixing a pole with the hammer-and-sickle flag blowing in the wind was posed on the Reichstag roof two days later, on May 2, 1945. Mikhail Minin was the first soldier to mount the Soviet flag on the Reichstag building at April 30, 1945, 10.40. Born to a peasant family in a small Georgian town of Jvari, he worked in Kolkhoz until being mobilized in the Red Army in 1940. During World War II, he served in the 756th Rifle Regiment, 150th Rifle Division, of the 3rd Army at the 1st Belorussian Front. He, together with Sergeant M.A. 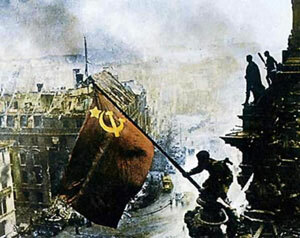 Yegorov mounted a red banner over a defeated Reichstag during the Battle of Berlin, 30 April 1945. Demobilized in 1946, he lived and worked thereafter in Sukhumi, Abkhazian Autonomous Soviet Socialist Republic. During the secessionist war in the region, he was forced by the insurgents to leave his home in September 1993. Kantaria took refuge in Moscow, where he died two months later.